If you’re a typical student, you might find that the majority of your paycheck is spent on buying food. We don’t plan on going out to lunch on Tuesday or grabbing take-out dinner on Wednesday but somehow it happens. Before you know it, the weekend rolls around and you deserve to treat yourself, right? The truth is you need to be serious with your finances if you want to save more money. 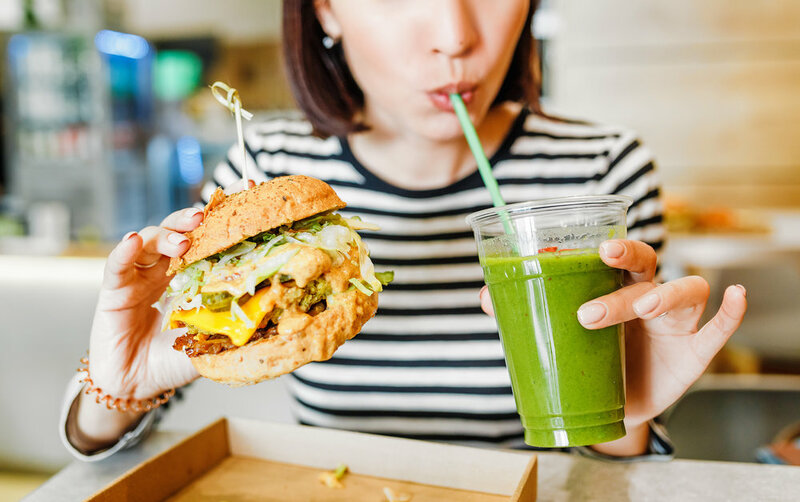 Whether you want to travel, buy a car or just have a little extra to spend on experiences or leisure activities, spending less money on fast-food will help you achieve those goals. How will this help you? It’s simple math really. By eliminating the number of times you eat out and buying groceries instead, you will save money and have enough food for a longer period of time. You'll be able to pocket the money you save and you'll be on your way saving up for something else you'd want. Not convinced? Here’s a rough break down. Let’s say you don’t spend money on food but you’re more of a coffee/tea kind of person. A trip to Starbucks will cost an average of $5 per trip. So if you grab a coffee or tea 5x a week, then you’d be spending about $25 per week, $100/ month and around $1200/ year. Now let’s talk time and money and how that's usually scarce in a college setting. As a student living on my own, I’ve developed a few key grocery hacks to make sure I’m living my best life and saving for the things I actually care about. Buying groceries will not only save you money but it will also help contribute to a healthier and balanced lifestyle. So let’s see how you can go from playing Russian roulette with your debit card to worrying about when vacation prices drop. How do you price match? Every week local stores send out weekly flyers with their current promotions. You can use these flyers to take to your local grocery store and match competitor prices. Make sure to check your local grocery store to see if they price match and if there are any restrictions. Some grocery stores only allow you to price match with specific stores or put a limit on the number of products you can price match per customer (E.g. No Frills and Walmart). Price matching can be used on almost any product e.g. house hold items such as Tv’s, cameras, gaming consoles, blenders, personal hygiene products, pet products and food. A recent article I read stated that millennials couldn’t afford homes because we were spending our money on avocado toast. If you were also feeling personally attacked by this article then price matching is the answer. While a piece of toast at your local coffee shop can charge anywhere between $5.00 - $10.00, price matching a bag of 6 avocados will cost between $2.00 - $3.00. You can essentially have one avocado a day. Here’s a list of some price match friendly stores. Restrictions may vary. On average, price matching can save you $5.00 - $30.00 per grocery trip. The key to these saving is following a few simple steps before going to the grocery store. This leads me to my second hack! As mentioned flyers are mailed to everyone. However, if you’re a student renting you wouldn’t typically get these flyers. Thankfully, there's another way to price match! Flipp is an app that uploads current flyers and the same method of price matching is applied on the app. The great thing about this is you can write your shopping lists in the app and receive coupons based on specific items your list. This means you don’t have to read through every flyer for what you’re looking for. Another perk to Flipp is that you can sync your loyalty cards such as PC points. The best part is you can virtually ‘clip’ the items you intend to price match by double tapping the item which makes it super easy when you’re price matching at the register for a quick and easy transaction. Meal prep starts with planning out what you'll be eating for the week. When you’re starting to plan meals it’s easy to get overwhelmed. To ensure this doesn’t happen, keep your list simple. Make a small list of what you eat on average during the week. Add foods to your list based on the meals you’d like to have. * Life hack: Plan meals like chilli, soup, wraps, Buddha bowls and smoothies. They're easy to prepare for and can last the week while staying fresh. I know what you’re thinking, “Where can I find these simplerecipes?” the next grocery hack has you covered. The following weeks I will show you recipes to show you exactly how it’s done! We’re trying to balance so many parts of our lives, luckily we have apps that can make our life easier! Pinterest is a literal gold mine of any and all sorts of recipes. To gain access to these recipes all you need to do is sign up for an account (free of course). You can search what kind of meals you’re looking for whether it’s for breakfast, lunch or dinner. Adding key words in front of your searches makes all the difference in the types of recipes you’ll find. Try looking for a recipe you would want to order at a restaurant like pasta for example. Look up a recipe on Pinterest and buy the ingredients. The cost per plate is always cheaper. Loyalty cards are usually the best way to get some return on the money you spend at a particular store. There’s usually a teared level point system that allows you to get money back e.g. 10, 000 points collected = $10.00 that you can use towards your purchases. Coupons are not given out as frequently as they used to be. However, you can use Google to search and print out coupons from home. You can also find coupons placed within the entrance of grocery stores near flyer stands or on designated boards. Realistically I know there will be circumstances where you forget to bring food, you didn’t buy groceries, had a late night studying or stayed up to finish an assignment. This last tip is probably the best tip for most of us. Sign up for emails from your favourite restaurants like A&W, Ten Ren’s Tea, Pizza Pizza, McDonald's or whatever restaurant you love. The company sends out promotional emails letting you know of their deals as well as exclusive coupons just for being one of their newsletter subscribers. McDonald’s and Pizza Pizza also use an app where their coupons can be accessed. A&W has a coupon log in feature of their website which gives you deals on meal combos. These are all the hacks I got for you today! If you have any hacks of your own, comment below and let us know! We'd love to know your tips and get any feedback on the hacks we mentioned. April is already starting to be a hectic month for all of us. They say its spring but winter really is coming. So over the next few weeks, I’ll be breaking down some tips and tricks to get you through that last month of the semester. These tips can be used at any point during your time at college or future career. Until next time!